It's been a long time since I've participated in the global City Daily Photo theme day, but I miss being part of it, and I had a perfect contribution as it is indeed Turtle Season. Click here, and here, and here, and especially here to see photos of snapping turtles, who cross the road, ver-r-r-r-y slowly, at this time of year. Last week, my daughter and I saw a very small one on the Rail Trail - no more than the diameter of a coffee cup, but just as fierce as the gigantic ones. Good choice for you this time, I can imagine how slow it is. Hi Jenny! 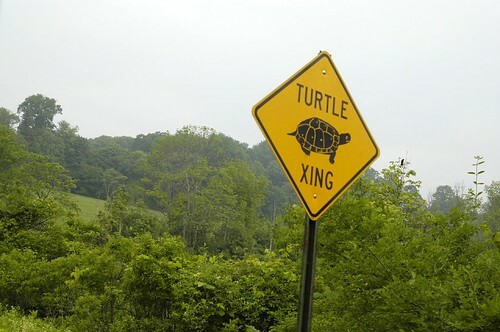 Terrific sign; love all these signs for "unusual" animals at crossings. There must not be too many turtles left. And just why did the turtle cross the road? Cute sign! We have a problem with turtles crossing a very busy road here and they are building an ecopassage under the highway just for them. Definitely a sign I'd never seen around here before, great pick for the theme. I love turtles, but the only ones I've seen around here are the fake, but realistic one I have for my garden and the water ones at Petco, nothing like the ones in your photo links. Nice sign Jenny. Happy theme day! Fierce is the right word for snapping turtles. What a fun local sign of great importance. Interesting how feisty the critters are, too. Near my parents' place in the Mohave Desert there are similar signs warning drivers about wild burros who cross the highway to get to the river for water each morning and evening.